Very fond memories come flooding back when I look at this photo taken by Dad – Ron Moss. Firstly it was taken in the back garden of the house I grew up in 7 Dudley Street, Old Hill, Staffordshire (this would be the address back when this photo was taken). 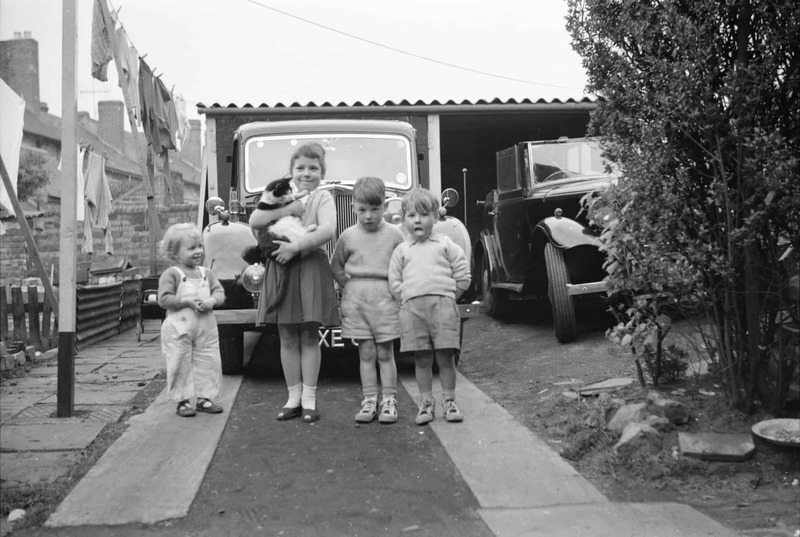 The photo is dated 1962 and shows my brother Gary on the far right, his school friend Stephen Jennings who also lived next door to us and myself holding one of our many family cats – “Dink”. Gary and Stephen would be 4 years old and I would have been 7. Our back garden was always full of children – mom welcomed the whole street – so it is not surprising that a lot of Dad’s family photos of my brother and I also included a myriad of local children. The house had a double entry between our house and next door so cars could be backed right up to the back of the house and the large entry served as a wonderful play area for nearly all the kids in the street. At the back of the photo you can see Dad’s two Lanchesters. He built a double garage to house the 2 cars which were his pride and joy. Dad has always had an interest in cars and the Lanchester immediately behind us was only sold in 2012 to a very excited polish gentleman who had it shipped off to Poland for renovation.